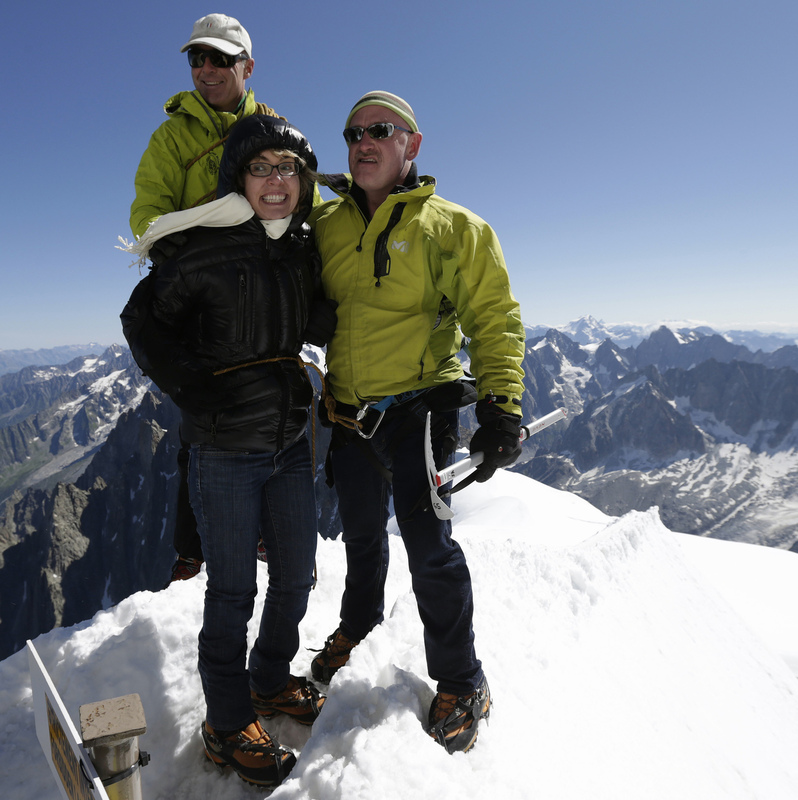 Feel-Good Photo: Gabrielle Giffords Atop A Mountain In France : The Two-Way The former congresswoman, who was critically wounded by a gunman in January 2011, looks thrilled to be high up in the Alps. Former Rep. Gabrielle Giffords (center) and her husband Mark Kelly (right), at the peak of Aiguille du Midi in the French Alps on Monday. Behind them is mountain guide Vincent Lameyre. After four days of sadly serious news about what happened in Aurora, Colo., here's a photo that may lift your heart. Reuters explains that former Rep. Gabrielle Giffords, D-Ariz., rode a two-stage cable car on Monday to the peak of Aiguille du Midi in the French Alps. That's 12,605-feet above sea level. Then, as you can see from the photo, she and her husband Mark Kelly enjoyed the view. Giffords was critically wounded on Jan. 8, 2011, when a gunman attacked a meet-and-greet event she was holding in Tucson. Six people were killed. Thirteen, including the then-congresswoman, were injured. Giffords, who was shot in the head, can walk again but often uses a wheelchair. Kelly, a former astronaut, was in Chamonix with other astronauts to install a plaque at a mountain research station. The plaque commemorates the last U.S. space shuttle mission. Kelly and the crew of the shuttle Endeavour took a particle detector developed at the nearby European Nuclear Research Center to the International Space Station.